Biltmore at Bay Colony is one of six of the premier luxury beach front high-rises located in the exclusive community of Bay Colony. Completed in 1997, Biltmore at Bay Colony is comprised of 22 floors with a total of 75 beautiful custom homes along with a five bedroom penthouse apartment. Biltmore at Bay Colony condos range in size from 2,860 to 7,000 square feet of one of a kind luxury living area. Each unit comes with 2 designated parking spaces located directly underneath the building. Storage areas are also available. Amenities at Biltmore at Bay Colony include a grand lobby, billiards room, top of the line equipped fitness center, heated swimming pool, hot tub, sauna, barbeque area and a private beach access to the Gulf of Mexico. Biltmore at Bay Colony homeowners are permitted to lease their properties once per year with a 90 day minimum term. 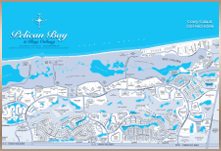 The Biltmore at Bay Colony community requires membership to both the Bay Colony and the Pelican Bay associations which entitles residents to access all the grand amentities including the private beach club facilties and restaurants. An equity membership in the exclusive The Club Pelican Bay can be purchased for the avid golfer. For the yachtsman a membership can be purchased in the Pelican isle yacht Club.